Liberia allows entry into its territory to foreign travelers having a passport and, for those who are not exempt from, a visa. This visa can be obtained from the competent diplomatic representation of the place of residence of the traveler. Each traveler on arrival is also subject to a biometric check from an immigration officer. Exemptions: Nationals of the following countries are exempted from visa requirements to enter Liberian territory: ECOWAS countries (Senegal, Guinea, Sierra Leone, Nigeria, Ivory Coast, Mali, Burkina Faso, etc ...) and South Korea. - The traveller is not allowed to get on board unless a confirmation letter is received from the station manager Monrovia. - A copy of the telex confirmation must be attached to the ticket. 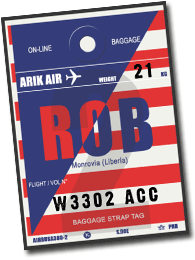 Warning: a passenger with no Liberian identity papers (passport or identity card) is considered as a foreign passenger and as such must have a visa.